This past weekend I was hanging out with Benjamin (Prairie Soap Company) at the shop and decided to knock out a few projects for my blog. I took along my favorite molds for salt bars and decided to do three different salt bars using interesting additives, natural colorants and amazing essential oil blends (which Benjamin helped me out with!). 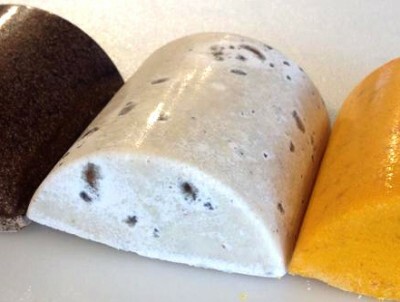 This series will include an African Black Soap Salt Bar, a Cocoa and Coffee Salt Bar and an Orange Oatmeal Salt Bar! 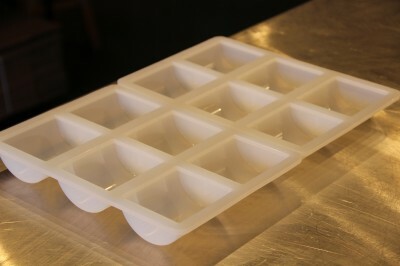 Cold process salt bars are super awesome to make for a couple of reasons. They are cheap to make! My favorite salt bar recipe is 100% coconut oil with a 20% superfat. 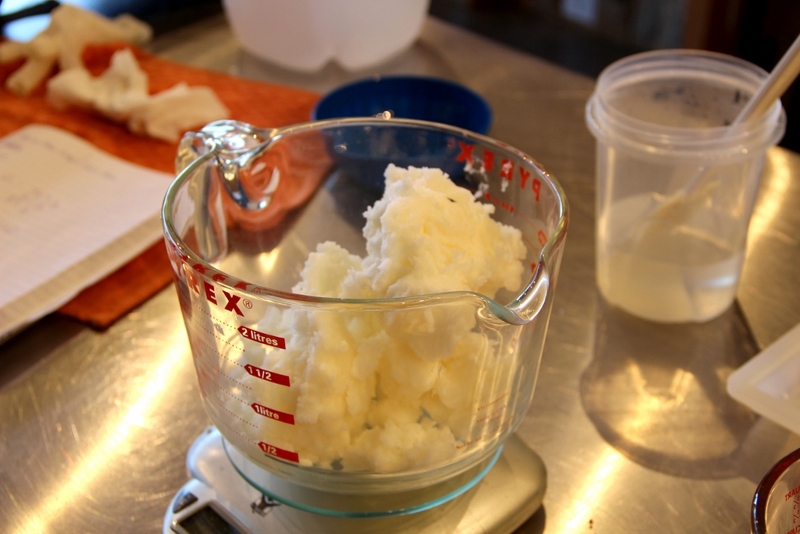 Coconut oil is one of the cheaper oils to make soap with. They have a luxurious lotion-like lather. Salt kills fluffy lather so don’t expect a super bubbly bar (even with 100% coconut oil). 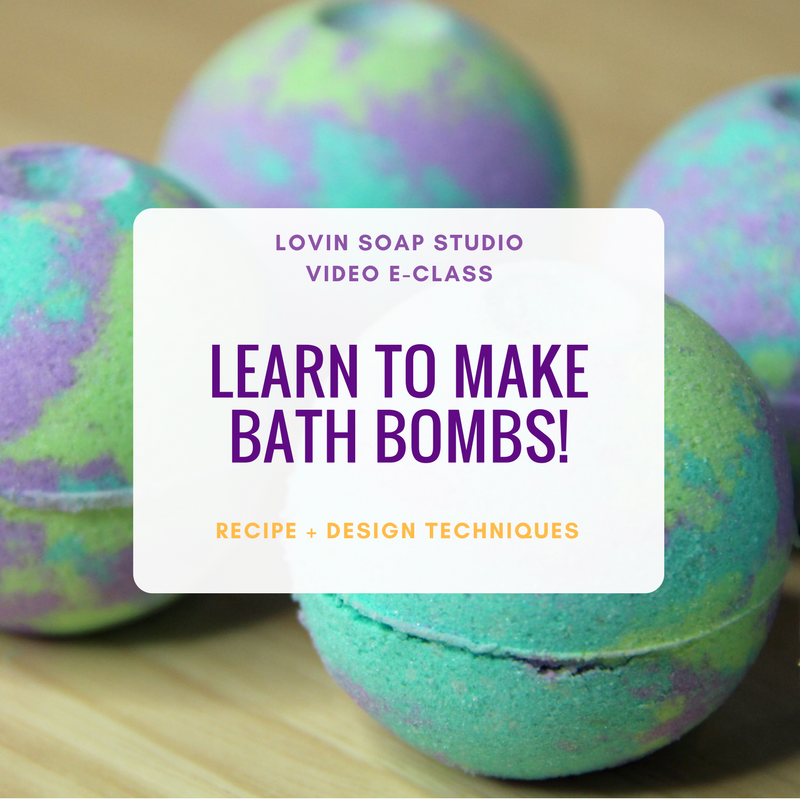 You will get some bubbles but they quickly turn into a lotion-like lather – silky, smooth and decadent. You would think that the soap is scratchy or exfoliating. Nope. Quite the opposite. I’ve heard bathing with a salt bar being compared to bathing with a smooth, silky river rock. You can have as much salt in your salt soap as you like. I prefer 50% of the oil weight, but sometimes do up to 100% (equal weight salt to oils). Because they set up fast and hard, I prefer to do salt bars in individual cavity molds. My favorite salt bar shape, and a way to make them unique and different than my regular bar soap, is a half round /half cylinder shape. This mold from Bramble Berry is absolutely perfect. Anne-Marie sent me one to play with and I immediately bought three more! Step 3 – Weigh out the salt, black soap crumbles and essential blend so that everything is ready to go! 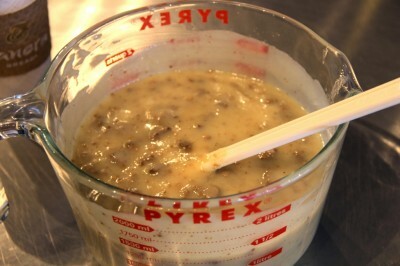 Mix and add the African black soap crumbles. Mmmmm, kinda looks like sausage gravy! 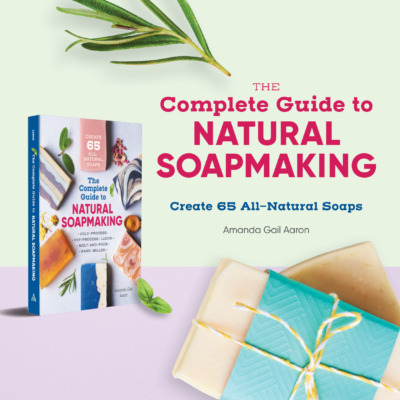 I would love to make this soap, but am wondering if I can omit the sea salt and use the same percentages of water, lye and coconut oil. 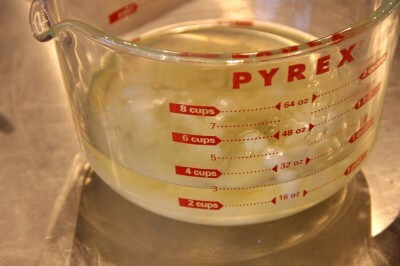 When I enter this recipe into soapcalc, it states to use 215g of water. Are salt bars water discounted? Thanks. Do you have a source for the half cylinder mold? I would think a soap bar made of 100% coconut oil would be very drying to the skin. This is what they recommend for laundry soap. Help me out here to understand why you did this. Thanks. Hi Natasha! 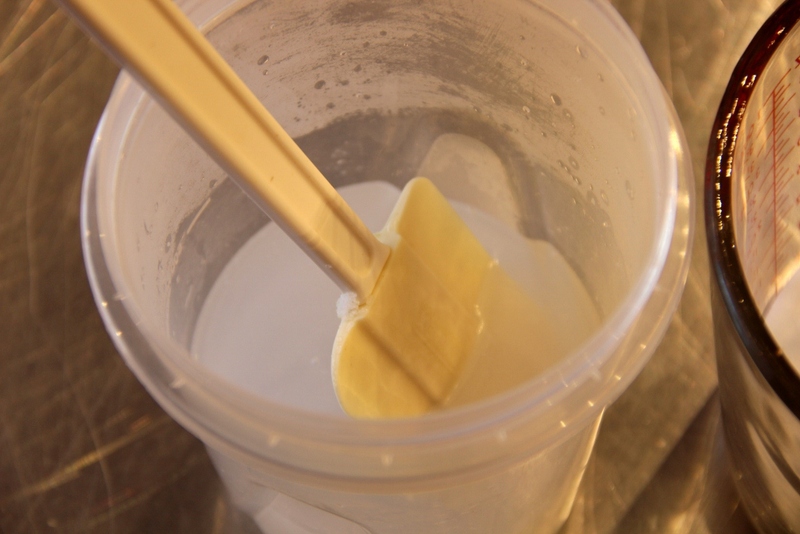 The high amount of coconut oil is balanced with a 20% superfat. The resulting soap is quite nice. 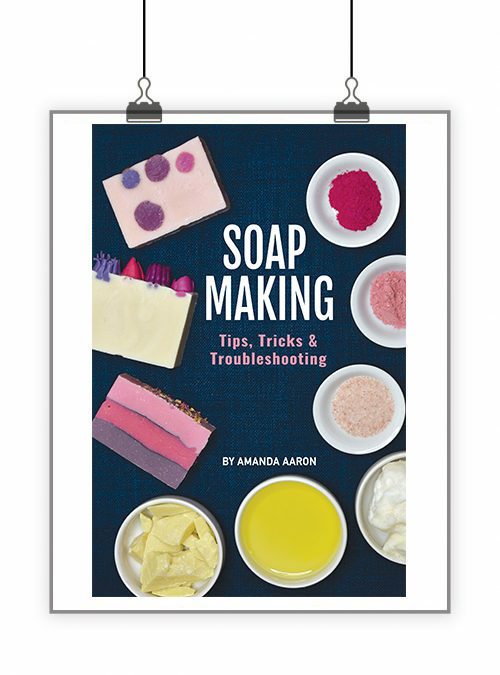 Many soapmakers make salt bars and love them. Thanks for the recipe. Great. May I know the oils you use to superfat this recipe? Thanks in advance. 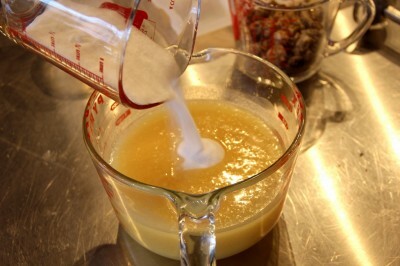 Hi ..I just found this recipe and was wondering instead of water can I use goats milk in it? 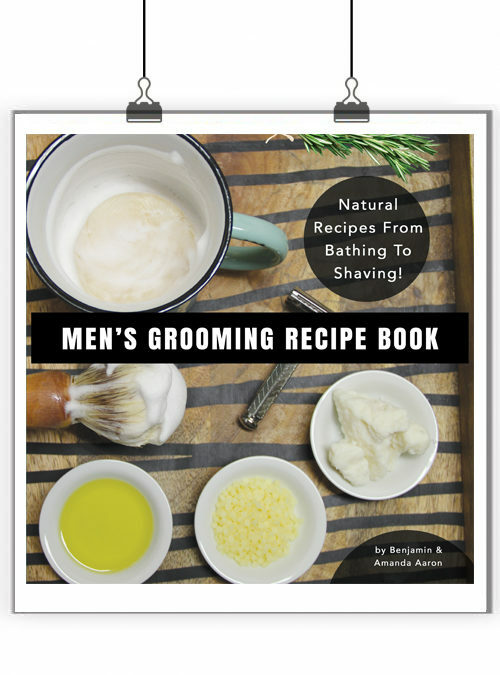 You can use goat milk for sure! I’m wondering if it’s absolutely necessary to add lye? I’m using black soap specifically to avoid having to use lye. 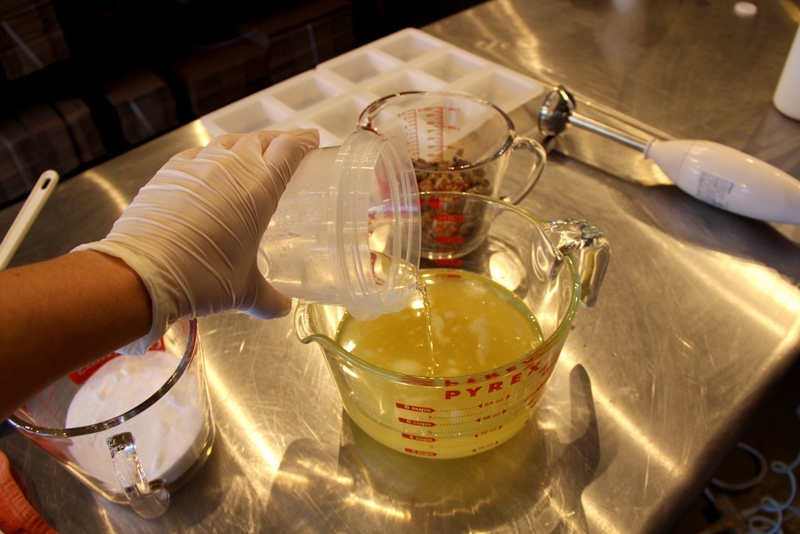 Yes, lye is what turns the oils into soap. You can purchase black soap already made so that you don’t have to use lye, but you wouldn’t follow this recipe as it is a soap-from-scratch recipe that uses lye. Hi! I love the salt bar recipes. I was just wondering what happened to the orange oatmeal one? I can’t find it and would love to try it. Your essential oil combos are amazing! 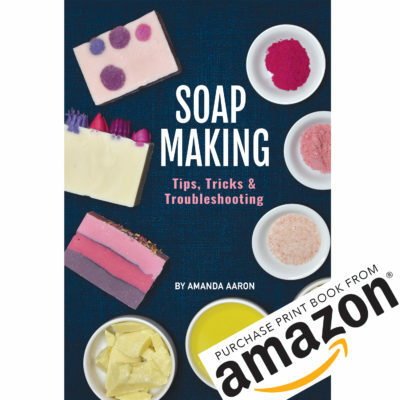 Could I use this same procedure for the “hot process” soapmaking? I made up a batch of oatmeal… then realized there were ‘webs’ on the INSIDE of the bag! ( clue: what hatches – flies! meal worms at work – EWWW), and then couldn’t bear to simply chuck it (yep, I’m beyond frugal). So… set about converting it into wonderful (omg! SO MUUCH!) soap with oatmeal additive. 9 pounds of soap later, I added almost a full 2 lbs of salt to get it to harden beyond just being gel like (this took about 4 or 5 rebatchings and salvage attempts), even now, smells super, is very latherful and tests perfectly. It’s been a solid learning experience, but sometimes, being stubborn (and cheap) can pay off in a big way. NOW all my neighbours are clamouring to become testers for new batches of thrown together recipes. Undoubtedly, given my propensity to experiment.. there’ll be a lot of ‘new’ stuff to try out before I do anything else with it. 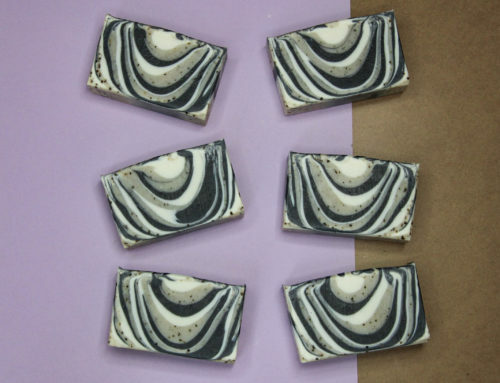 I just made this soap today, using your exact measurements. However, instead of your EO mix, I used a FO/EO blend of bay rum FO, and cedarwood and francincense EOs. Smells great but the bay rum is definitely the dominant scent. One question: why do we need to let the soap cure for 4-6 weeks before use? Since the salt hardens the bar faster, doesn’t it also rush saponification? 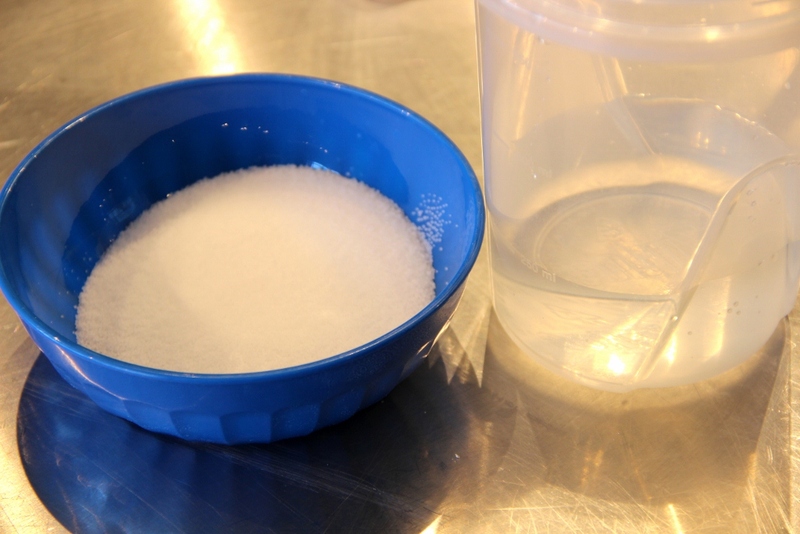 Salt does speed up saponification… but for a reason I cannot explain salt bars are best after 8-12 weeks of curing. 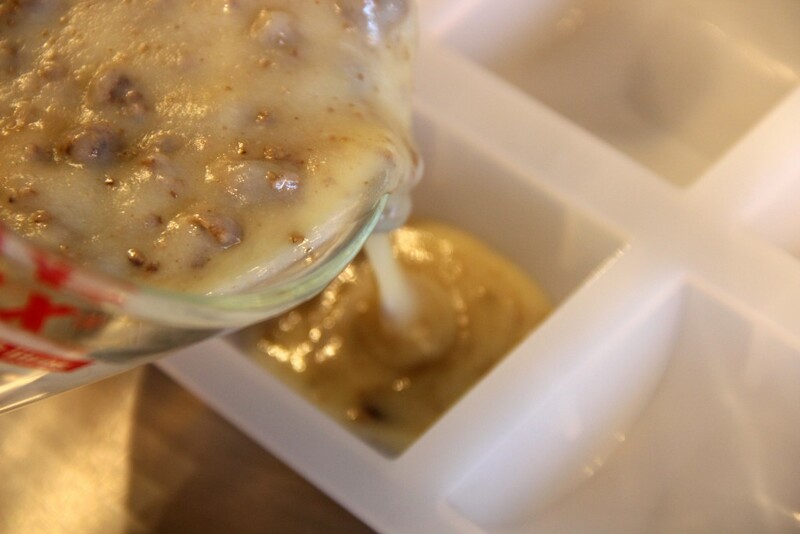 The lather becomes a lot more creamy and luxurious, and the bar lathers more easily too. I made the African Black Soap Salt Bars using BB’s Lemongrass Essential Oil. I can not wait to use a bar. I purchased my African Black Soap from Soaper’s Choice which is where Mr. Benjamin thought was the purest form. I had to order 10 lbs because that is the only way they sold it. Now, what else can I do with all that soap? Awesome! 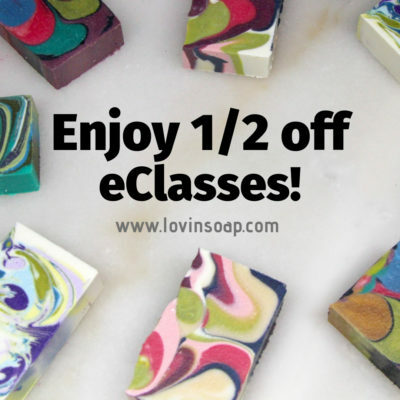 You can add it to many different products including other soap recipes (not counted in lye calc) and scrubs! 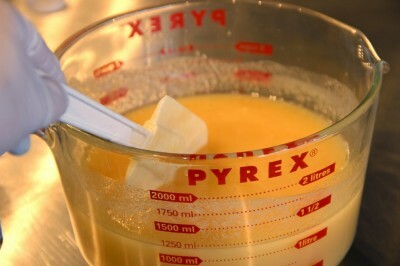 Its also great to use as is and makes a wonderful face soap. Customers will purchase it just as it is also. This is just the recipe I was looking for. Thank you! 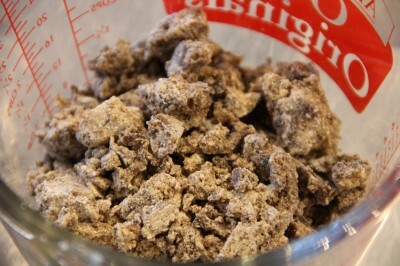 If I change the proportion of Black Soap crumbles or salt will my lye amount change or do I just treat them as additives? I want to make a larger batch and use less salt. My guess is that I’m only using the lye for the un-saponified oils. Is that correct? Thank you again for your wonderful site! Can I leave out the salt altogether? You can! And because of the high superfat, it won’t be too dry. 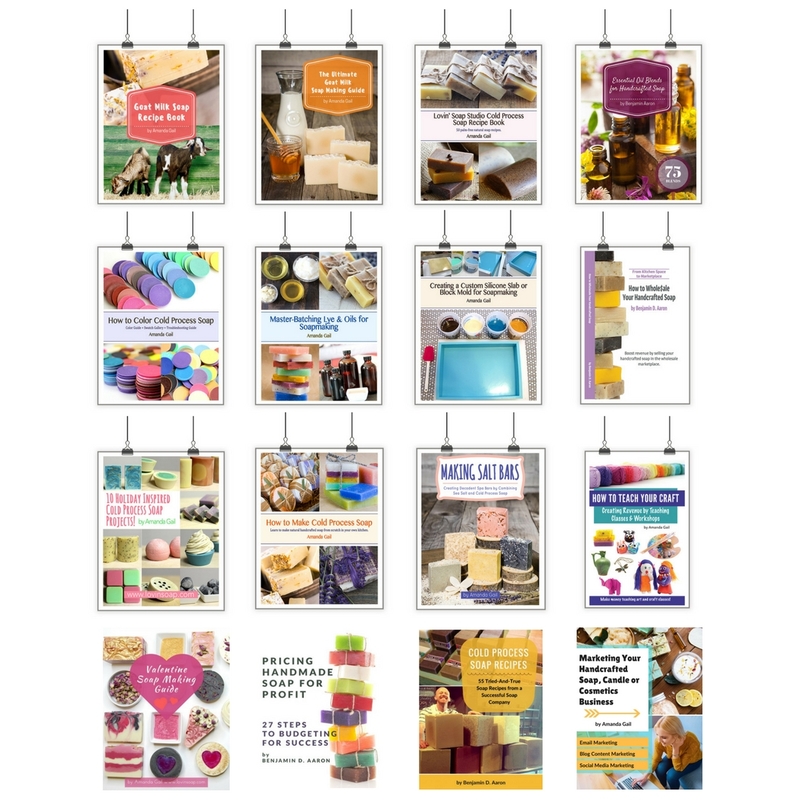 You might like it or not… Let me know! Well, I left out the salt and just made a coconut bar with the black soap crumbles. I love it! The soap has big bubbles and is very creamy as well. I like having a way to hold those African black soap crumbles together in one bar! I have a picture of it on my website. I couldn’t figure out how to post a picture here. 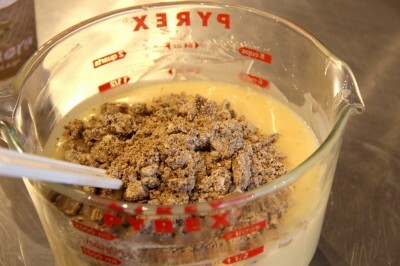 So the crumbles are treated like an additive and can be added to any soap recipe? It might be nice with goat’s milk soap. Thank you! Yep, since its already saponified, just treat it as an additive! 🙂 Glad it came out well! Wondering, does the premade african black soap have palm in it? I cant find that info on the soaperschoice site? 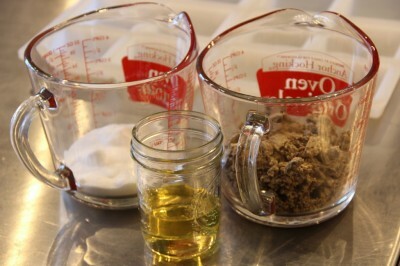 I would love to make the african black soap myself. Do you think I can just add the coconut carbon directly to this recipe? I would really like to know this too! I’d love to make this recipe, but I’m very strongly anti-palm and I’m hesitant to use a premade soap that I’m not completely sure about the ingredients. Is there an alternative to the premade black soap? I’m thinking I could just leave it out, but I like the appearance. Thanks for all the great recipes! I am so thrilled to have found you online. 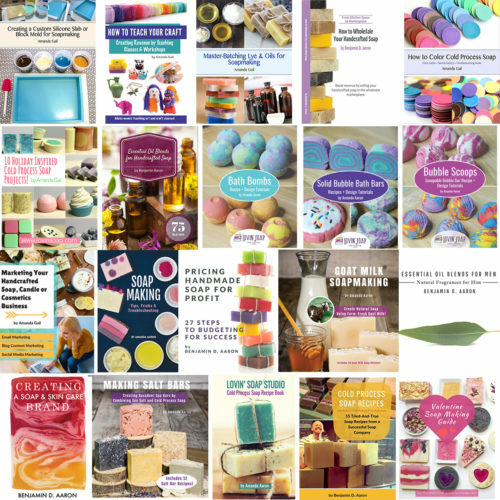 I want to start soap making and prefer not to use palm oil. Do you have some simple recipes to start me off. I just want to make simple, good quality, moisturising soap. Any help and advise you can give would be so appreciated. 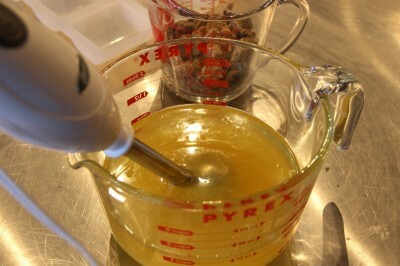 Just wondering whether you have ever made African Black Soap. A tutorial on that would be great ……. just a suggestion! I’ll have to give this a try since my last attempt at a salt soap was a total botched batch. One question on the 100% coconut oil – in my research I thought that too much coconut oil made for a drying bar. Does the salt mitigate that? Hi Sarah! Great question! 100% coconut oil can be drying and that is why we use a 20% superfat. That gives us lots of unsaponified oils to counteract that issue. That is so cool. The combinations are unique. 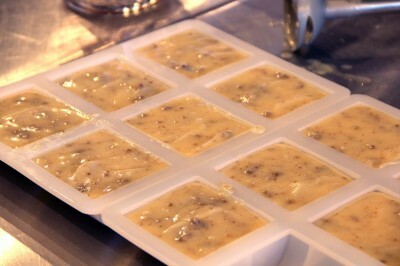 I’m doing the ABS salt bar tomorrow since I have to make ABS luquid soap for the family. Thank You for sharing!!! Ooooh, this is exciting. 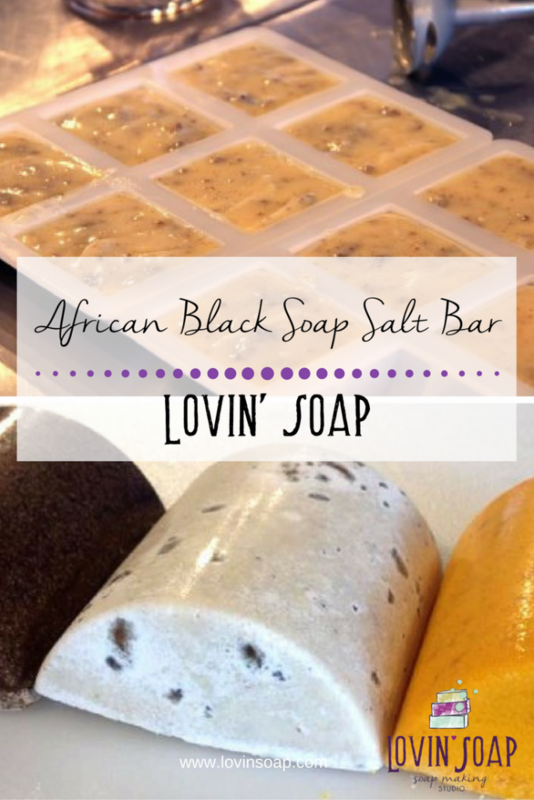 I really like salt bars and adding black soap is genius! Will try this as soon as I can. I use 75% salt but 50% makes more sense if I’m going to add dry crumbly black soap as well. Thanks for the great tutorials! I’ve learned so much! I am very interested in making this soap but I have a few questions. How many molds does this recipe require ? Could i have the other two salt bar recipe’s also. I would love to try these. I read something on adding salt to soaps from David Fisher – About.com…About Candle & Soap Making. Hi Renee – stay tuned! I’ll be posting them this week and next. How did you determine the amount of salt in the recipe? Did you use a soap calc or some other website for the amount? Thanks. Hi Ellen – I typically use 50% of oil weight in salt. So since I had 567 I used 283 g of salt. You can use as much or as little as you like. Some people even use equal amounts of salt to oils. All a matter of preference. Can you convert your grams into ounces please. 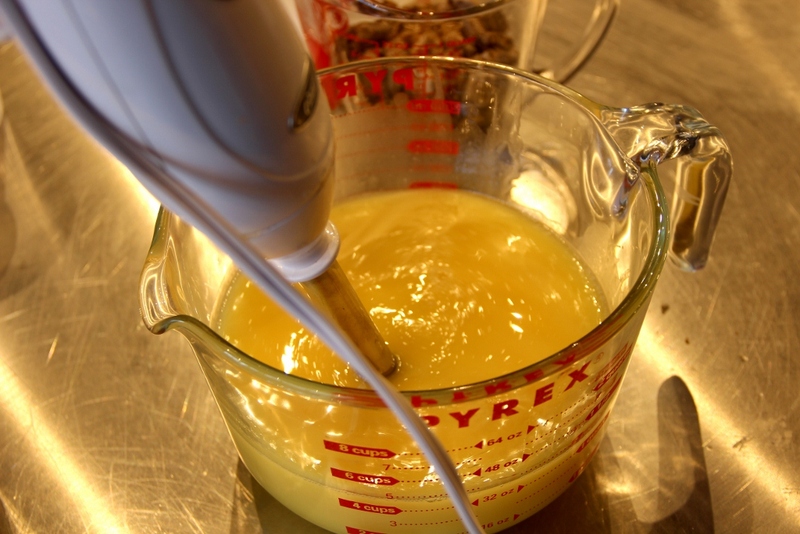 Also does this recipe fill all the cavities in this particular mold? Hi Renee – you can use an online calc to convert grams to ounces and run the new ounce recipes through a lye calc to get the precise amount of lye needed. This recipe filled up 11 cavities.